How many blogger-in-Paris cliches can I fit into one photoshoot? With the help of Emily, basically all of them lol! Peonies? Check. Pink? Check. Iconic/basic location (the Palais Royal)? Check. Over the top outfit? Check. All I am missing is a door picture and maybe a baguette. But in all seriousness, sometimes there is nothing wrong with indulging in some tried and true cliches, like picking up pink peonies or a fresh baguette in Paris. Why are we as individuals more and more concerned with feeling special and/or unique? I think in many cases, the search for more unique or "authentic" travel adventures can actually take away from your overall experience (you can read more about my issues with the notion of authentic travel here). Even Daphne (a fabulous Parisian blogger we met up with in Paris and who you should follow) laughed that she buys a baguette everyday and never grows tired of navy stripes or pink peonies. Don't get me wrong, I definitely love trying new things, researching atypical destinations, and thinking outside the box. 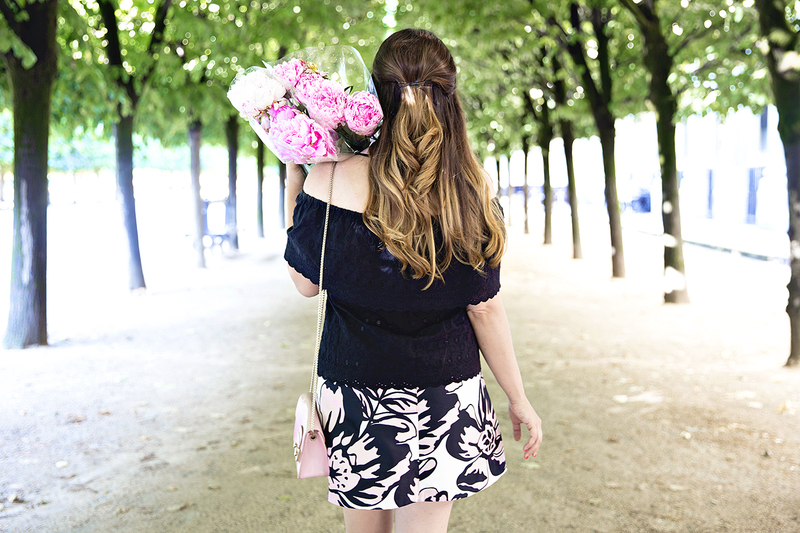 But, if posing with pink peonies in Paris makes me happy, I am going to do that too! I also love getting dressed up for Paris. Paris is an elegant city and is the type of place you can have a bit of fun with your look. You might recognize this skirt (I picked it up in Florence), but instead of pairing it with the matching sweater and collar, I detached the collar and wore it with an off-the-shoulder top. I thought it was a fun addition that created a completely different look with virtually the same pieces. You can to get creative when you travel and typically at this point in my summer abroad, I am dying for something new to wear! After driving through Provence, Burgundy, and the Loire Valley, Emily and I were happy to ditch the car and enjoy a couple low key days in Paris. We basically just took a ton of photos, visited our favorite places, and ate our body weights in cheese. And as I mentioned earlier, we also met up with Daphne for brunch at a great little place called Claus. Paris with Emily was the perfect ending to a perfect trip! Emily and I (not surprisingly) turned out to be perfect travel partners and we have already starting planning our next adventure!